An Insider’s Guide… Everything you needed to know about Acupuncture, but were afraid to ask! Many things may have brought you here: back pain, allergies, threats from a loved one-whatever the case, let me answer a few common questions. Please contact our office if you have any further questions. While we know the effects of it, such as decreased pain or blood pressure, for example, we do not really know how it works. But then, how does aspirin work for a headache? We know it does work, but the how…not so much. What we do know is that there are meridians that run up and down the whole body. They connect to all the organs in the body, as well as well to the nerves, muscles, the endocrine system, and basically everything. It is thought that disease, or pain, is caused by a disruption of the flow of energy, or Qi. By stimulating certain points along the Meridians, the Qi is restored to a proper flow, thereby decreasing pain and imbalances that can lead to diseases. An analogy is to think of the electrical wiring in the house. Electricity is much like Qi. It is energy, but requires a pathway to function. The electrical wires behind the walls run all around the house. We can access and use electricity from certain places such as outlets, or light switches. Acupuncture points are like those outlets. We access the body’s Qi there. Are you putting medicine on the needles? There is nothing on the needles! They just activate your own body’s healing system. Ok, so let me say that this is not a religion. This is not about belief or faith, or being open minded or wanting to get well, or a positive attitude. Acupuncture is a method of treatment that helps 85% of the time, for 85% of people for 85% of most conditions. Those are pretty good odds! What if I can’t relax, will it still work? Yep! You do not have to relax for it to work. It’s nice to relax, but not required. It will work 85% of the time regardless. I treat a lot of kids. Trust me, they are not good relaxers and it still works! Should I feel something with the needles? Some people feel things with the treatment, and some don’t. It still works 85% of the time. What if a point really hurts? Occasionally a point will be really sensitive, or even give off an electrical charge. It means that the Qi was really stuck there. It often happens in places where you are experiencing pain anyway. It does not mean that we hit the wrong spot, or hit a nerve or put it in too deeply. Just let us know and we can take it out. It may or may not every happen again. Is it safe for children, pregnant women? Absolutely! This medicine has been around for thousands and thousands of years. It was the only form of medicine for quite some time. It is not dangerous. Occasionally when the needles are taken out, there is a tiny amount of blood. It is thought that it is your own body’s way of releasing even more Qi to relieve pressure or stress. What if I’m on a blood thinner? Blood thinners do not affect the amount of bleeding. It is fine to have acupuncture when you are on them. Bruising does happen sometimes. It is not that we hit a nerve or a wrong point. It usually means that your Qi was really stuck in that place at that time. Will it interfere with my Physical therapy? Chiropractic care? Absolutely not! In fact, acupuncture can be an incredible compliment to physical therapy, chiropractic and massage. They all can support the body’s healing ability and get you better even faster. Can I still take my western medication? You need to keep on whatever regimen your doctor has prescribed. If you wish to get off any medications, consult your doctor on the proper way to do that. Should I take my pain pills if I am coming in for pain relief? Yes. If you have been on pain medication and go off of it suddenly, you can have rebound pain and get much worse, even with Acupuncture. See your doctor and do it gradually. Please allow 45-60 minutes from start to finish for private and semi-private appointments, and 30-45 minutes for community appointments. For a private session, allow a little over an hour, but after the first visit, you usually will be out in about 45 minutes. Am I getting a real treatment with semi-private and community acupuncture? Yes! The main difference between community, semi-private and private sessions is the time we spend talking, and whether there are other people in the treatment area. Though sometimes with extremely complicated situations, private sessions can give us more time to address things. Community sessions do not allow for a front and back treatment in the same appointment. We also do not offer cupping at Community acupuncture. How many issues can we address at once? Most of the time we can address many different things at once. But occasionally we might have to break it up into different sessions..
At my clinic, needles are left in about 20 minutes. Many of you may have had treatments that last almost an hour. This is a common thing in China. However, in Japan, sometimes the needles are not left in at all. They are put in and taken out at the same time. Studies have proven that it works, regardless of how long the needles are left in, or not left in. It takes 20 minutes from the first point put in for all the meridians to be balanced, so that’s about what I do. Why don’t you stimulate or twist the needles? Shouldn’t I feel it for it to work? Acupuncture works regardless of whether the needles are stimulated or not. I myself am sensitive and get anxiety when the needles are stimulated. (it hurts!) Since it works well enough by leaving them alone, I choose that style. But you may request to have the needles to be stimulated if that is your preference. So, how do I know if I am part of the 85% or the 15%? Will it work for me? Try it! But, give it a fair try. Most people know if it’s helping after 1 or 2 sessions. Of course, some issues are resolved in 1 or 2 sessions. If you don’t feel any better after 2 sessions, it’s me, not you! Try another acupuncturist before giving up. Would you go to an M.D. once or twice and give up completely on Western Medicine if it didn’t work? Probably not! It is more likely that you would try another doctor. Well, give us the same chance, and try another Acupuncturist! Just like doctors, massage therapists, or any type of practitioner, we all have our different strengths and weaknesses. Mainly you will have relief, or a change in frequency or intensity of your issue/s. If it’s a progressive disease, a slowing or stopping of the progression is a sign it’s working. It really depends on what we are treating. If it is pain, you might feel less pain, even for a little while. You may not notice a change for a day or two. Occasionally some people feel light headed. This is usually due to not eating enough before a treatment. What if I feel worse after the treatment? Once in a while, some people feel worse after the treatment. Maybe you will sleep for a very long time. When this happens, it’s often that you were exhausted and the body was able to let down and rejuvenate. Please let me know if you do get worse and we can take care of it. Sometimes pain gets aggravated. In some cases, this is often referred to as a “healing crisis.” The way to know if the acupuncture is aggravating your condition, or just stirring things up as the energy starts to flow is, how do you feel after? If after the aggravation of your symptoms, you feel much better, then it was more like a healing crisis (we don’t use that term very much). It rarely happens every time. If your pain gets consistently worse after every session, try another acupuncturist, or even another type of treatment. Do I need to do anything special after the treatment? In general, you do not have to do anything in particular. Refrain from doing anything to aggravate your condition. For example, if running makes your back hurt, switch to something else while we are treating your back. Most conditions require 1-10 sessions to resolve. Generally, the longer you have had something, the longer it may take to get rid of it. Kids usually get better even faster than adults. In China, most conditions are treated 1-2 times a day for 10 days and the re-evaluated. Most people cannot do that here! But the more severe your condition, the more frequently you should come in at first. As you get better, come less and less often. Once you are feeling good, you don’t have to come back, unless your condition flares up. Will Acupuncture cure my condition? Sometimes people have 1 or 2 treatments and the condition never returns. Some people need to come back every few months to keep it from returning. It depends what you are doing that may aggravate it. Progressive diseases are good to be treated regularly. Regularly could be every month or twice a year. It depends on how severe your symptoms are, and where you are in the stage of disease. Are there other things to help the Acupuncture work better, and do I need them? Acupuncture can often work by itself to resolve your conditions. Please refer to my website under conditions to find out about other remedies that can aide your recovery even further. What if there is nothing specifically going on with me, can I still come in? Yes! In China, people would come in at the change of every season to maintain their good health. Even coming in once in a while can be a good ‘tune-up’ for your body, mind & spirit. 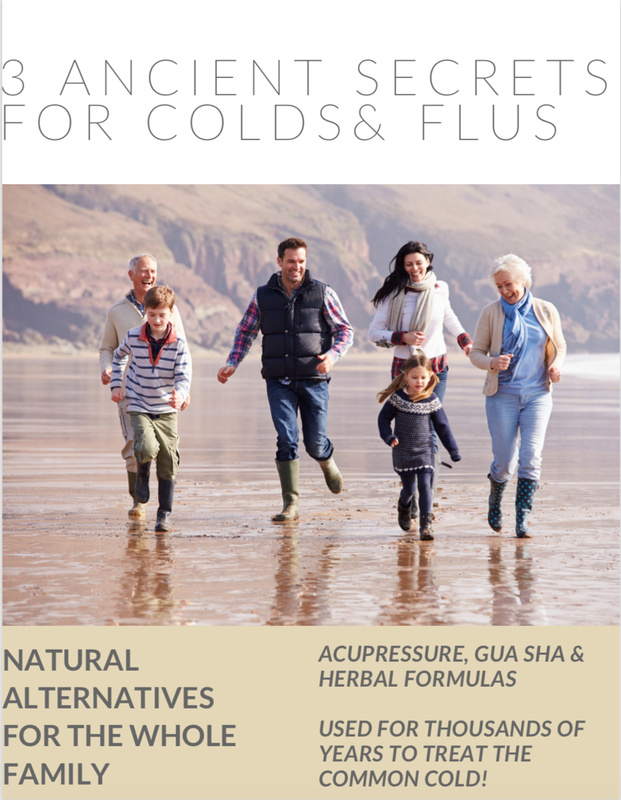 I have herbal formulas for many conditions with instructions on how to use them & where to get them. · I have recipes for easy treats that do not contain sugar or gluten. · I have newsletters about all kinds of health- related topics. · I have resources for other practitioners, modalities, books & websites for more information. For any kind of stomach condition such as nausea, vomiting, diarrhea, stomach flu, food poisoning, morning sickness, gas or bloating, did you know there is an amazing herbal formula that has been around for thousands of years? This is one of my go-to formulas. I always have it with me, especially when I travel. You can get it from our online store, Ancient Health and Healing or from Chinese herbal markets. The dose is on the bottle. A great Acupressure Point for any stomach trouble is Pericardium 6. Located on the underside of the forearm, about 3 inches from the wrist. This is where those ‘sea sickness bands’ are placed. Hold it for 3-10 minutes. It works great! Coming down with a cold or flu? When taken at the first sign, this can help prevent you getting sick! Or, it can help you fight it off faster, or not feel so icky. It’s great for sore throat, fever, chills, headache, sinus congestion, infection. Dose up right away! Take a couple pills every 1-4 hours until symptoms are gone! This is a great Acupressure Point-Large Intestine 4. It is between your thumb and index finger, on the fleshy part below the crease. This is great to get rid of colds & flus, headaches, tooth pain and sore throats. Both of these formulas and Acupressure points can be combined to help you feel better in no time!